Swanage Lifeboat Crew would like to wish all our Fundraisers, Supporters and Followers a very Merry Christmas and a Happy New Year. Stay safe over the holidays, we will of course be on call throughout the period if you require our services. An appeal to our online friends and followers. In the early part of next year the lifejackets at Swanage Lifeboat Station will be replaced with new ones. The new lifejackets will provide increased safety for all sizes and shapes of volunteers with a comfortable, secure fit leading to increased efficiency and effectiveness in lifesaving. 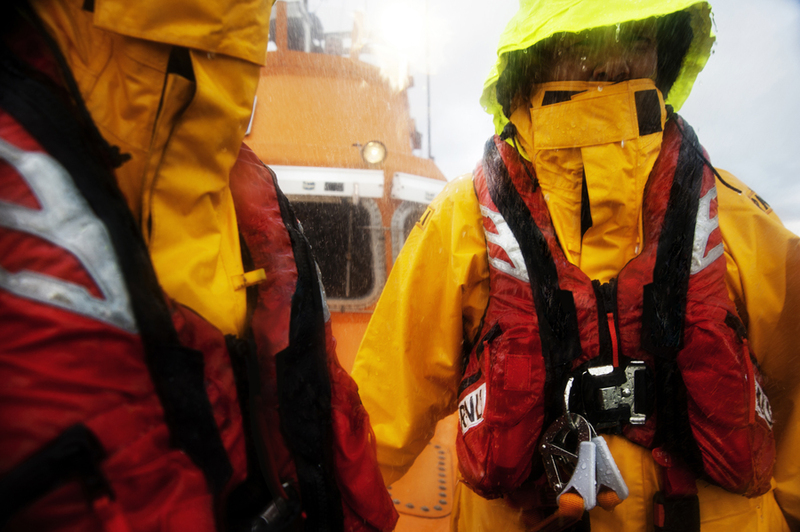 They are fitted with crotch straps, which prevent the lifejacket riding up over the wearer’s head when in the water, and an integrated harness, designed to pull the lifejacket away from the neck allowing greater freedom of movement while rescuing people. There are also zipped pockets for casualty care kit, torches, gloves or knives and a spray hood designed to protect the wearer from sea spray. 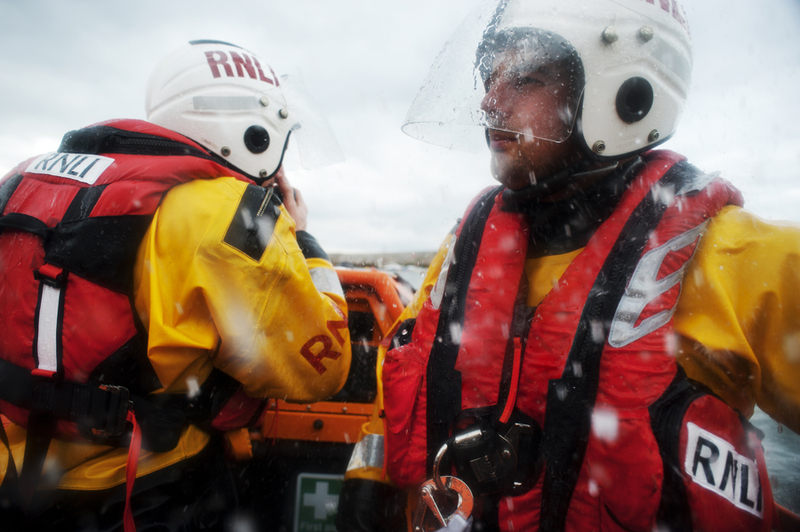 Ultimately the improved lifejackets should lead to increased effectiveness in lifesaving. Each station has been asked to fund raise for the new jackets and we were hoping that our 1000 Facebook friends and our 600 Twitter followers might help us kick start the appeal. We have set up a JustGiving page [ H E R E ] , there's also a 'Donate to our Lifejacket Appeal' link on our Facebook page. 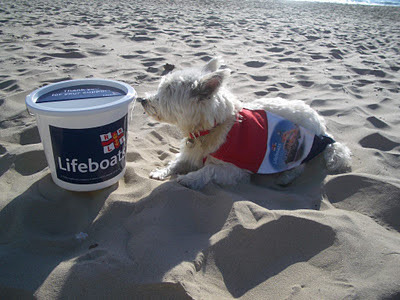 We've set ourselves a target of £680 which will buy 1 x ALB and 1 x ILB lifejacket. We know its the run up to Christmas but if each of you could spare just £1 that would nearly double our target. It was nice to see so many people at our AGM last week, thanks again to The Pines Hotel for their hospitality. As well as the usual reports and speeches we also had a few awards to give out. One to Ros Bishop for her service in the Lifeboat Shop, one to Kevin Dimarco (pictured below) for his 13 years service to the RNLI from May 1997 to Nov 2010 and one to Paul O'Connell for his service from Mar 2004 to Nov 2010. At the end of the meeting our Chairman, Robin Tiller, announced that he would be standing down and handing over the reigns to Peter Foster. Robin assures us that he will continue with fundraising for the RNLI but he felt it was time for him to handover as Chairman. The photo below shows Peter (pictured right) presenting Robin with a gift from all at Swanage Lifeboat Station to thank him for all his efforts over the years. Its that time of year again. We'd like to invite everyone who is able to attend to our Annual Open meeting that also includes the Swanage Lifeboat Guild AGM. The meeting is held at The Pines Hotel in Swanage and starts at 19:30. Our Coxswain, Martin Steeden, will give a short report on the year's activities. Our Chairman, Robin Tiller and Lifeboat Operations Manager, Neil Hardy will also give their reports. This year we have a number of awards to present people with and as normal we have a guest speaker. We are delighted to welcome Chris Eves from RNLI HQ in Poole. Chris is the FCB2 Project Manager and will be giving us all an update on FCB2 (The Shannon Class All Weather Lifeboat). If you are able to join us you'd be more than welcome. We were delighted that Rear Admiral John Tolhurst was able to open our new training room last week. Rear Admiral Tolhurst is the Chairman of the RNLI's Operations Committee and also one of the RNLI's Trustees. He was in Swanage with the Coast Review Team for our 5 yearly review meeting. The new training room used to be the Coastguard's Cliff Rescue Equipment store and has been transformed into a classroom and meeting room for us. It will also be used to give talks to school/youth groups before they go to the lifeboat station to see the boats. We had a surprise visitor at the Lifeboat Station today. Buster the dog! Buster is raising money for the RNLI as he runs up and down all the beaches in Dorset! Buster would like to run on all the beaches in the country, but it's best to start in a modest way. This is to be with beaches in Dorset, beginning in Poole, the home of the RNLI. If this is successful, he may move on to other sections of coast. Buster and his owner stayed for a while, took a couple of pictures and then it was time to head off to the beach for a run. Thanks Buster, hope you had a good run! Over the last 6 weeks we have been trialling a Wide Area Siren for RNLI HQ. The trial is now over and the sirens will be taken down in the next few days. 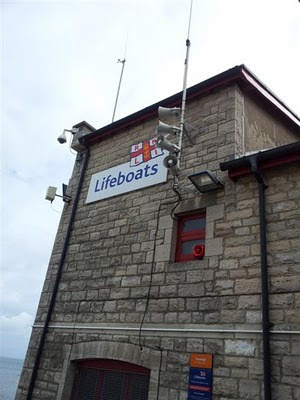 The siren was being tested as a way of alerting volunteer crew, the public and nearby boating traffic to the imminent launch of a lifeboat. Does the sound travel into the town? Is the sound too noisy in the local area? Do people know what the noise is? Is between 7am to 10pm the right time to activate it or could it go off 24hrs a day? If the overall feedback is positive should it be fitted permanently? If you've got any feedback then please either send it to Robert Aggas, the RNLI's Fleet Operations Manager on robert_aggas@rnli.org.uk or to us here at the Lifeboat Station. We were delighted to welcome Mr & Mrs Coakes to the Lifeboat Station today. Mrs Coakes had purchased a single raffle ticket earlier in the summer for the chance to win a wonderful original painting by local artist, Rebecca Lardner. The painting is handed over to the delighted winners. Robin Tiller, Chairman of Swanage Lifeboat Management Group is presented with a cheque for £5000. We'd like to thank Rebecca, everyone at The Mulberry Tree Gallery, everyone who helped to sell the tickets and everyone who bought them. Limited edition prints of the painting are available at the gallery but they're going fast!